Dinner at Christina's: Cans for Comments: Delivered! As you know, you guys helped me reach 41 cans to give to a food pantry. Yesterday we shopped and dropped them off! I live in Cook County, south of Chicago. 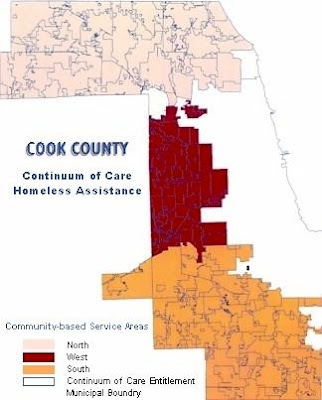 In the map above, Cook County is divided into four sections. I'm in the orange section, so I searched in that area for food pantries. There were 55 results, just in my orange section alone - 1/4th of the county! Wow, 41 cans felt tiny all of a sudden! With a heavy heart, I set out reading up on ones closest to our house until I settled on one I really liked. They offer a whole slew of services, not just a food pantry, so I know their staff is probably over-worked and under-appreciated. I called to see if they needed anything specifically and the woman told me they were completely out of any proteins and the supplier that sometimes donates to them informed them it will be quite awhile until they receive anymore. So, Johnny and I, with my visiting parents set out to Aldi (awesome canned prices!). We didn't stop at 41, though! It just seemed so small in the cart, we wanted to help more! We ended up getting 48 cans of tuna, 12 cans of chicken breast, 12 cans of pork and beans, 16 boxes of stuffing mix, and 24 packs of ramen noodles! That's a grand total of 112 items and it felt great to drop it off, especially knowing that more than half were proteins, which they really needed! That's so awesome! Congrats for making such a helpful and positive impact so close to home. Great job! I love Aldi. Oh Christina!! How fantastic you must feel. You look so cute in that picture surrounded by food! We dropped ours off today I might get a post written tonight. We'll see :) Take care. Great job Christina!! Wow, that is a lot of need! My mom works at a food pantry two days a week - she said this past Saturday they had 212 families come through - up 75 from the previous week! NICE JOB!!!! i loved that idea! Our office donated a nice sized check to the food pantry in our area. Everyone needs help it seems! !